Combine dates, sugar, nuts, and water. Some methods have the nuts added after, my family usually just throws in the nuts at the beginning. I’ve done it both ways, tastes the same. Bring to a boil, reduce heat and cook slowly until thickened, stirring frequently. Let mixture cool. Place the cookie dough between two pieces of wax paper. Roll the cookie dough out using a rolling pin. Lift the top sheet of wax paper. Shape the cookie dough with your hands to more of a rectangle shape if too round. Place filling onto rolled out cookie dough. Spread filling out leaving about 1/2 inch around all the edges. Using the wax paper as you guide, starting at one of the long ends, slowly roll up the cookie dough in jelly roll form. Roll up dough in waxed paper and seal ends to prevent air from getting in. Place in fridge for at least 4 hours if not overnight. If in a super rush you can place in freezer for 30 minutes. Using a serrated knife, slice the cookie log about 1/4 of an inch. Using your hands, reshape the cookies into more round forms. Place cookies on a greased cookie sheet. Bake at 375°F for 9-11 minutes and get golden brown around the edges. The filling will stay up and the cookies will sink a little making the spiral very predominate. I turned my nose up at Date Pinwheel Cookies as a kid, but now I love them. We had them every year at every Christmas (and only at Christmas) I can remember. They were just a boring cookie with fruit in them ("Ewww", said the 10 year old me). But as I grew, so did my palate. Now it’s a different story. If they aren’t on the giant cookie tray I feel like something is missing! To make things a little easier on myself this year, I decided to try making them using Pillsbury Sugar Cookie Dough. They do taste different (as the originals use brown sugar) and they look a little different, but I actually like the look. The original cookies are brown on brown; this version makes it easier to see the pinwheel. Note: These instructions below are for one roll of cookies, but the recipe is for two rolls. Simply follow the instructions again to make the second roll. To make the cookies, begin by gathering dates, sugar, nuts, and water. Then combine them. Some versions of this recipe have the nuts added after; my family usually just throws in the nuts at the beginning. I’ve done it both ways and it actually tastes the same. Shape the cookie dough with your hands to make a rectangle shape. Place filling onto rolled out cookie dough. Spread filling out evenly, leaving about a 1/2 inch around all the edges. Using the wax paper as your guide, start at one of the long ends and slowly roll up the cookie dough in jellyroll form. Continue to use the wax paper to roll the cookie dough. Roll the dough all the way up until a log is formed. Roll up dough in wax paper and seal the ends to prevent air from getting in. Place in fridge for at least four hours, if not overnight. In a super rush? You can place in the freezer for 30 minutes. Using a serrated knife, slice the cookie log, making about 1/4 inch-thick slices. Bake at 375ºF for 9-11 minutes until they get golden brown around the edges. The filling will stay up and the cookies will sink a little, making the spiral very predominant. 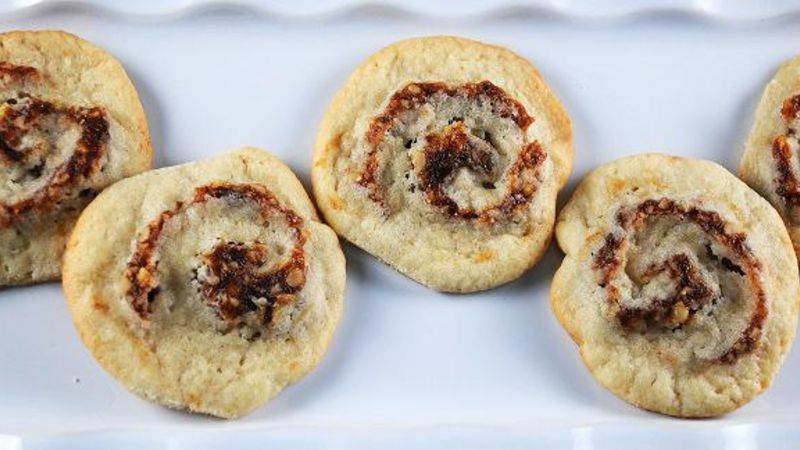 Add these delicious date pinwheels to your holiday cookie tray and enjoy!